GREAT MILLS, Md. -- Authorities on Wednesday released a few additional details into the shooting at Great Mills High School in southern Maryland that left the shooter dead and two students wounded. Austin Wyatt Rollins, 17, was killed Tuesday after shooting a schoolmate, 16-year-old Jaelynn Willey. A school resource officer got there within a minute and fired a shot at Rollins, but it's not yet clear whether he was killed by the officer's bullet or took his own life. Investigators said that they have video of the shooting and that will help them figure out exactly what happened, CBS News justice and homeland security correspondent Jeff Pegues reports. 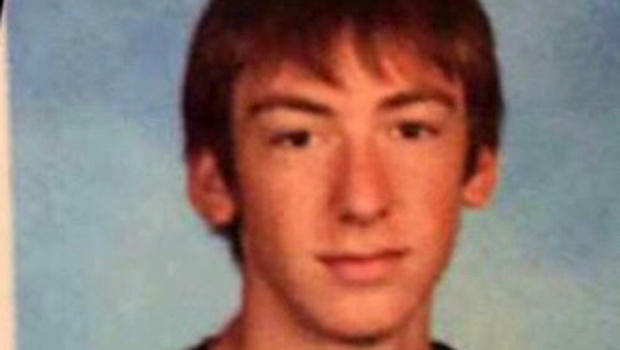 Austin Rollins is seen in a photo obtained by CBS News. The St. Mary's County Sheriff's Office said Wednesday that Rollins and the girl had been in a relationship that recently ended. Authorities had previously only said that the two had had a relationship of some sorts. "All indications suggest the shooting was not a random act of violence," police said in a statement. St. Mary's County Sheriff Tim Cameron said earlier that a precise determination of Rollins' motive may be impossible now that he is dead. The girl was still fighting for her life at the University of Maryland Prince George's Hospital Center. A fundraising page to help Willey's family has raised more than $54,000. Hospital spokesman Michael Schwartzberg said in an email Wednesday night that she remained in critical condition. Attempts to reach Rollins' family were unsuccessful. A day after the eruption of gun violence in one of the sleepy community's schools, the few residents who ventured out amid a snowstorm blanketing the East Coast praised the school resource officer who responded, Deputy First Class Blaine Gaskill. "He did a very, very good job," said Sharon Eglinton, manager of a cafe in nearby Leonardtown. Eglinton, herself a Great Mills alumna, noted that Rollins was by all accounts a good student who had not shown any warning signs. She said she thinks the best way to prevent future school shootings is to install metal detectors at schools. "I have no problem paying for it," she said. "If you can protect people getting on a plane with metal detectors, you can protect people in schools." While investigators are still determining whether Rollins took his own life or was killed by the officer's bullet, Cameron credited Gaskill with preventing any more loss of life. The Enterprise, a local newspaper, reports Cameron said at the time that Gaskill had "used exemplary judgment." On Wednesday, authorities said the Glock handgun used in the shooting was legally owned by Rollins' father. In Maryland it is illegal for anyone under age 21 to possess a handgun unless it is required for their employment. People who knew Rollins were trying to make some kind of sense of Tuesday's hometown horror. "Never in a million years could I have imagined he would do something like this," said Adlai Traver, 18, who attended Great Mills and knew all three kids involved in the shooting. He recalled playing cards with Rollins during band class when the fellow percussionists had a little down time during class. "I was in the car when I heard it was him. I pulled over and almost puked."